"Sweet pork chops with sweet gravy." Heat the oil in a large skillet over medium heat. Stir in apple juice and lemon juice. Mix in garlic, mustard, and honey. Season with parsley, celery seed, and pepper. Cook and stir until thoroughly blended. 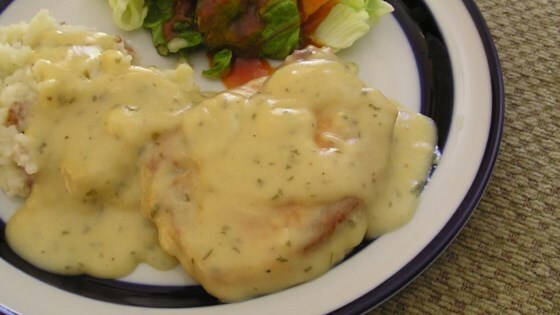 Place pork chops in the skillet, coating them with the apple juice mixture. Cook 20 minutes, or to an internal temperature of 145 degrees F (63 degrees C). Remove chops from heat, and set aside. In a small bowl, thoroughly mix the milk and flour. Stir into the skillet, blending with the remaining apple juice mixture. Simmer, stirring occasionally, until thickened. Serve over the pork chops. Pork was dry sauce was GREAT!!! I liked these and so did the hubby. The only problem I had was having to add about a cup more apple juice to have any sauce at all. Thanks! Very simple and absolutely delicious. I spread the mixture over the pork and let it marinade for a few hours. It was a perfect dinner with some yellow rice and vegetables.